(REUTERS) - Jon Jones returned from a 15-month doping ban to reclaim the Ultimate Fighting Championship light-heavyweight title with a third-round technical knockout win over Alexander Gustafsson, capping off a dominant display with a series of ground strikes. 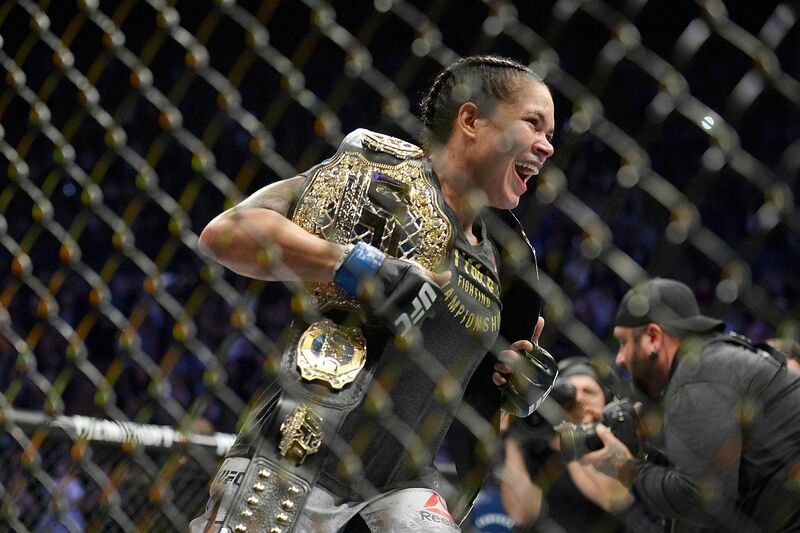 In Saturday's (Dec 29) co-main event, Amanda Nunes scored a devastating first-round knockout win over fellow Brazilian Cris Cyborg to add the featherweight title to her bantamweight crown, becoming the first woman to hold two UFC belts simultaneously. The high-profile victories came at the end of a turbulent week for the UFC, who were forced to switch the event from Las Vegas to Los Angeles after the American was denied a license to compete in Nevada due to concerns over recent drug tests. California stepped in at the last minute to grant a license to the former champion, who was stripped of his belt following a positive test, and the stage was set for a re-run of the epic bout between the pair that took place five years ago. However, Saturday's contest at the Los Angeles Forum was a more sedate affair, with Jones managing the range much better, out-manoeuvring and out-thinking his Swedish opponent on the way to a superb, yet easy win to capture the vacant crown. Jones, 31, used his long reach and superior array of strikes to win the first two rounds, circling away from the Swede and landing some painful kicks on Gustafsson's torso and lead leg. The American took the fight to the ground early in the third, flattening out a fatigued Gustafsson and working methodically to turn him over before unleashing a series of strikes to the Swede's unprotected head to end the fight. "This is great, this is a great feeling," Jones said in a post-fight interview before calling out rival and former two-weight champion Daniel Cormier, who lost the light-heavyweight title to Jones but was reinstated after the latter's positive test. "Daddy's home DC, prove to the fans that you're the 'champ champ'. I'm here, I'll be waiting," Jones said, goading Cormier, who was relieved of the title after turning his focus towards defending the UFC heavyweight crown. Nunes, who stepped up a weight class, wasted no time in landing a punishing series of left hooks and overhand rights to dethrone Cyborg in a slugfest, rocking her opponent back on her heels early as both women traded blows. The 30-year-old sent her dazed compatriot crashing to the mat as she scored a superb knockout victory in just 51 seconds, before crying tears of joy after becoming just the third UFC fighter to hold titles in two weight divisions simultaneously.